Currently available in the U.S. and the U.K., mobile payment service Apple Pay will be coming to Canada and Australia before the end of this year. The inclusion of Canada is not a surprise since the country has been rumored for some time to be a destination for the feature. As early as this past April, there was speculation that the service would make its Canadian arrival during November. Two weeks ago, Canada's TD Trust Bank accidentally listed Apple Pay on its website as an option for its customers paying bills. 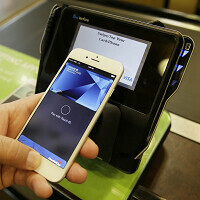 The news, which was announced by Apple CEO Tim Cook during the company's fiscal fourth quarter earnings call, also mentioned that Apple will be partnering with American Express for the Canadian and Australian launches of the mobile payment service in those countries. Apple also announced that Apple Pay will be available next year in Singapore, Spain and Hong Kong. Still missing from that list is China. Apple, which has become a very popular brand in the country, apparently is still having trouble getting UnionPay and other Chinese financial institutions to sign off on a deal. 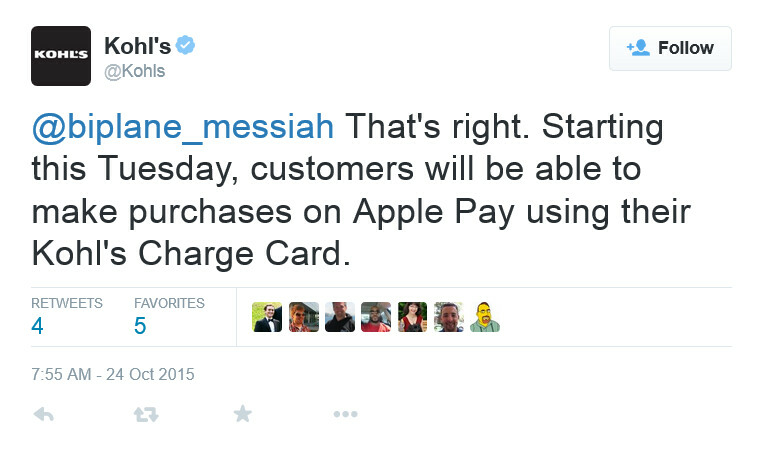 Kohl's also tweeted the news today that its branded credit card will now work with Apple Pay. The card is the first store-branded one to work with the mobile payment service. Now that this has been announced, we can expect other retailers like JC Penney and BJ's Wholesale Club to add their branded cards to the lineup. Two worlds for you. Samsung Pay! Google were the first. Apple made it popular(of course. lol) But Samsung took the cake of it. Samsung pay launched here in the US with 5 banks. Guess how many banks it supports a month later? It depends how patriotic the US banks are. Don't forget that US economy depends on Apple. And must support it. Like Obama did. US court too. Wall Street too. US is not the World though. BTWhttp://www.theverge.com/2015/10/27/9621464/samsung-pay-support-more-banks-gift-card-discover "A week after finally picking up support from Verizon, Samsung has announced an expansion of Samsung Pay, its mobile payments solution. Samsung has signed on 14 new banks for Samsung Pay: Chase, PNC Bank, TD Bank, SunTrust, Fifth Third Bank, First Hawaiian, Key Bank, Silicon Valley Bank, Security Service Federal Credit Union, Navy Federal Credit Union, Virginia Credit Union, Associated Bank, Randolph Brooks Federal Credit Union, and People’s United Bank"
BTW "in the coming months"
So? They have 4 major banks now , and 14 to come. What's the problem? Samsung Pay works in EVERY shop with or without NFC. Google and Apple can't do it. I understand, though, that Samsung is not US company and every US patriot must bashing it. Take it easy. I agree that those US banks must sabotage Samsung if they are patriots, as I've said above. And the US media too. Keep expanding it! Google Apple, and Samsung are taking it to the masses. No matter which phone I rock, I've got mobile payment. If I get an AppleWatch, it's got it too. #Covered. Does Samsung also take 2% cut on every transaction???? BTW Samsung Pay works both with every possible shop and with NFC too. No need of NFC terminal for Samsung Pay. Works everywhere. But it works with NFC too. Meh, I don't think I'll ever use this unless they stop making physical credit cards or something.